CBDpure hemp oil is one of only two products from the brand, and we like them both a lot. The quality of the CBD oil itself is high, so you’re only left to choose between having it sublingually or swallowing a soft gel. We already knew that their softgels worked very well, but what about CBDPure hemp oil? Although we expected a similar result, we had to put it through our process and see if it was up to standards. Keep reading below and see what we found. CBDPure is one of the few companies we’ve come across that focuses exclusively on CBD oil. They extract full spectrum CBD oil using a chemical-free CO2 process, which we know to be the best extraction method in use. CBDPure uses certified organic industrial hemp grown in Colorado, free of harmful pesticides and herbicides. The hemp used has been chosen selectively for its high CBD content and is grown with great care in order to produce a high-quality product. All CBDPure products come with certified lab tests and reports for each lot number and batch upon request. 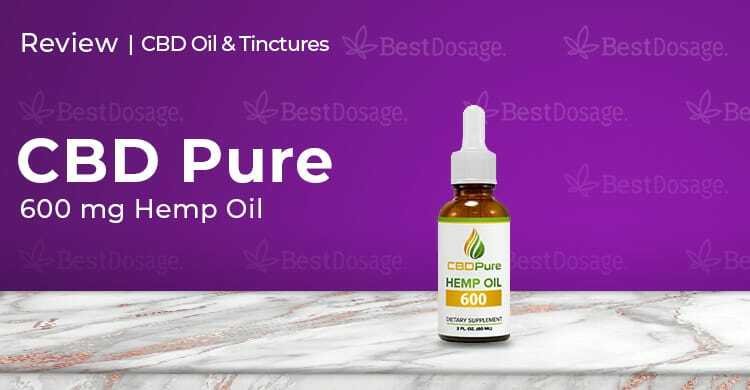 Unlike most companies that stick to the term CBD oil, CBDPure actually calls this product hemp oil. It’s the same thing, of course, so don’t be confused when the label reads CBDPure hemp oil. This 60ml bottle contains 600mg of CBD, but they do have lower strength options in 300mg and even 100mg form. This is CBD-rich organic hemp oil and nothing gets filtered out, meaning this is a full spectrum CBD oil. As with all their products, this is backed by a 90-day money back guarantee. Just like their softgels, CBDPure hemp oil is packaged in a similar way as other all natural supplements. It even says “dietary supplement” on the label. That labeling and the logo are distinct, and on the back, you’ll find the ingredients listed as well as dosage suggestions. Opening up the bottle, a distinctly earthy smell meets your nose. It’s a light smell and most of us happened to like it, but it’s there. The dropper attached to it is fairly accurate and easy to handle, so we didn’t have any problem dosing correctly. After trying some, we all agreed that it had a flavor that matched its scent. Namely, a natural hemp taste that is rather light, but again definitely there. Suggested dosage on the CBDPure hemp oil bottle indicated 10mg of CBD, which is half of a dropper, twice a day. If you’re new to CBD, start with less, perhaps half of that. Work your way up gradually. Chances are you’ll need more than the recommended dosage, especially for pain. We found that half a dropper between three and four times a day is what made sense for most of the team. However, as always with CBD, take it low and slow and figure out what works for your own body. This is a high-quality CBD oil and from the get-go, we expected good results in terms of effect. Thankfully, we weren’t disappointed. Those of us using it for anxiety were able to experience relief as soon as it set in. It did take around 30 minutes to feel something, but it was clear and definitive in the relief provided. Those using it for pain needed a little more, but it also worked great once they got there. It didn’t seem to do much for our resident insomniac, but otherwise, we had a happy team all around. The effect itself was long-lasting. It varied from person to person, but somewhere in the area of 6-8 hours was normal. Probably the best way to communicate with CBDPure is through their onsite live chat. The support team responds within a few minutes and are always helpful. Facebook chat, on the other hand, is a waste. Stick to the onsite live chat or email them directly. CBDPure does not offer free shipping, but they do ship to every U.S. state, minus Arkansas (AR), Kansas (KS) and Louisiana (LA). They do not ship Internationally. Contact customer support for a free shipping code. $79.99 per bottle. As low as $56.67 if buying 6 bottles. The advantage with this product over the softgel is that it sets in faster. Some people do love the natural hemp flavor and say it adds something. You’re also able to microdose, adding a few drops instead of having to take a full softgel. There’s a lot of flexibility in choosing to go with CBDPure hemp oil. On the other hand, if you don’t want any flavor at all and prefer your treatments come in pill form, the CBDPure CBD softgels 750mg is what you want. You really can’t go wrong with either, especially since all CBDPure products come with that reassuring 90-day money back guarantee. That makes the choice to go with CBDPure an easy one, and we definitely recommend it.